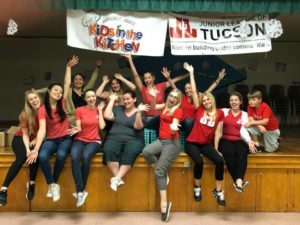 Kids in the Kitchen – Tully Elementary | Junior League of Tucson, Inc. Kids in the Kitchen is a Junior League community initiative that engages kids and parents in the preparation of healthy meals, and to provide education on nutrition and healthy lifestyle choices. February 2018, we returned to Tully Elementary Magnet School. Our volunteer members spent the evening with more than 20 kids and their families. We shared dinner, read books, and made crafts together. “Volunteering tonight at the Family Night at Tully Elementary and it was especially special to me because I used to be a student there. I remember being on the free lunch plan and eating in that big cafeteria that seems much smaller to me now. 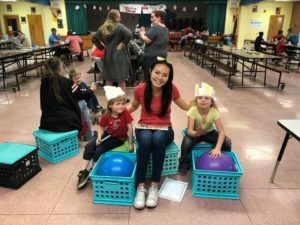 I loved reading books and getting to know the kids there because it gave me the opportunity for me to tell them that they can achieve all the things I have and more if they keep working hard at their dreams.” – Yue Z. “Family Nights have truly become one of my favorite events to volunteer at. Being able to interact with families, provide a warm meal and provide educational opportunities, while having fun is truly a rewarding experience! !” – Tiffany P.